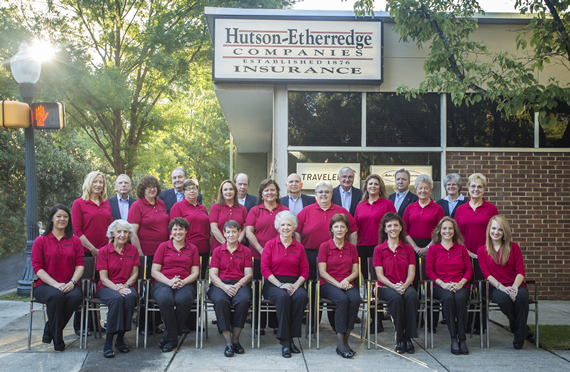 Hutson Etherredge Companies Independent Insurance Agent South Carolina Since 1876"
Hutson-Etherredge Companies is Aiken's oldest and largest Independent Insurance Agency. We have been providing Aiken and the surrounding area with the best in insurance services since 1876. This is stated humbly with both great pride and gratitude. We hope you will take a few minutes to visit with us on our website, learn more about us and why we feel you are so important to us, and then we hope you come see us for your insurance. We're very proud of our heritage. Visit with John C. Hutson, our founder in 1876. Note the important contributions to business and community by those who followed him, including Ashhurst, Etherredge, Brown, and Weeks. Our founder and his successors believed in sincerity and integrity in business. So do we! With a staff of 23, we are well equipped, trained, qualified, and experienced with the sole purpose to help you. Our insurance professionals have advanced insurance education, most with AAI or CIC degrees. We know what we are talking about. We represent many of the industries finest insurance companies that offer a broad array of coverage; and there is virtually nothing we cannot insure. Let us "go shopping" for you to find your best coverage at your best price. Discounts! We have them too! Virtually every policy we sell has discounts applied and we will make certain you get every discount available. What will not be done is to jeopardize insurance coverage to "buy" business. This is #1 for us! We are first and foremost committed to you, our customer, to help you both when you buy insurance and when you need it. Commitment to community is our heritage and we practice it today. This year Hutson-Etherredge Companies is supporting over 70 community and civic programs, charities, and churches. We love to give back to the community we love. So why choose us for your insurance? Discounts, coverage, service, commitment; certainly, but maybe most important, what John C. Hutson started in 1876, sincerity and integrity. Unlike other agents, your independent insurance agent is not tied to only one company. You don't need to change agencies as your insurance and service needs change. Offers one-stop shopping for a full range of insurance products - home, renters, auto, business, life and health. Customer satisfaction is the key to an independent agent's livelihood. Therefore, serving you is your independent agent's most-important concern. Content © 2011, Hutson-Etherredge Companies, Inc.
For more information Contact Hutson-Etherredge Companies, Inc.